How To Avoid Hours Leaking In Consultancy With Time Tracking Software? 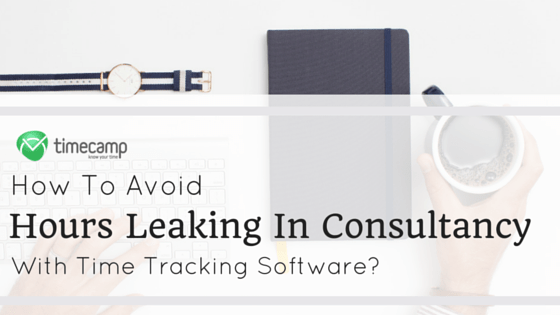 Home » How To Avoid Hours Leaking In Consultancy With Time Tracking Software? Time tracking is still not regarded as a reliable and solid support for employees in the companies. It’s rather considered as a software using for make them feel like being under control constantly. Most of the project managers are trying to change this way of thinking, but it’s not that easy to reconsider the stereotype. Based on the research, about 15% of chargeable work is not billed to clients. This statistics validates the theory that time is money – and employees are often wasting the time for doing unproductive things rather than working effectively. Recording their time spent at work is a sensitive issue and most of the people are not excited about it. About how to encourage employees to use time tracking software read here: Overcoming Employee Resistance Using Time Tracking Software. Writing all the ideas in calendars or on sticky notes doesn’t work properly – we live in tech-savvy era when we’re able to use more advanced devices like smartphones and personal computers. But the major mistake company owners usually do is that they postpone the decision of buying time tracking software as a support to the very last moment. However, human memory is sometimes unreliable, relying just on the power of our minds while lots of things are distracting us is illusive. The same is with procrastination – all the things like phone calls, emails and meetings are distracting us and we can’t focus properly on assigned tasks. Without using time tracking, people don’t even know how fast the precious time is gone. It creates cause-effect relation – the lack of time causes that they have problems with sticking to deadlines. Precious hours are leaking and people don’t even realize how much money does it cost. Using time tracking software prevents the situations when hours are not charged to clients properly. It differs of course across the professional services domain. Based on the research, the most billable are management consultants and filling their timesheets is fairly easy in comparison with lawyers and accountants, because their number of clients per week is definitely lower. Entering data into timesheets takes the representatives of two latter groups usually much more time. It often causes reluctance to time tracking software, because they don’t want to waste their time for filing papers. But there is a way to change this way of thinking – using automatic time tracking software. TimeCamp allows its users to track time on projects/task automatically basing on keywords. TimeCamp will start tracking time on a specific project/task each time it will be able to detect assigned keyword in application’s name or window title, as well as in URL addresses. What causes leakages the most? The leakage comes from variety of tasks, but the most important are emails, phone calls and meetings, because we usually waste most of the time on them. About 38% of respondents indicated that they bill less than 20% time on meetings. Laywers – 86% of time they spend. We have to realize that time losts means costs – based on this research, the average money leakage in all the groups is about €915 per consultant per week, which means a huge amount of money on an annual basis (we provided the similar research here: 5 Practices To Track Every Billable Minute P.1). That’s why automatic time tracking software is an answer, because it helps companies avoid the mistakes with charging billable work to clients. Time tracking also prevents wasting employees time on social media activities. Based on our prior research, from 4 million billed working hours, our respondents spent in total 75 thousand hours in social networks like Facebook, LinkedIn, Twitter and Vkontakte: Time At Work: How To Separate Private Time From Worktime Spent In Social Media? To increase the abilities of time tracking software you can use reliable project management software which will replace the traditional calendars and sticky notes perfectly. But choosing the right one is not an easy thing – even our team members could not decide which tool is most effective and meet our needs in 100%. That’s why we asked project managers for feedback: Project Management Tools: How To Choose The Best One? The answer is always better when it’s based on the experience. Time tracking software is not an enemy, especially when it’s automated. It’s a solution which prevents hours leaking, and, according to “time is money” rule, helps us avoid wasting precious funds on unnecessary things. That’s why employers shouldn’t be afraid of using this kind of software in their companies – there is always a time to improve employees time management skills. Look At These Productivity Articles Picked Just For You!